(1) Cars for sale in China. The most alarming story appeared in the 6/25 FT and was titled, “China’s officials forced to sell luxury cars.” Things must be really bad if they have to auction off their Benzes and Bimmers. The problem is that the cooling property market has deprived local officials of land sales, which has been a major source of cash. (2) Bad loans in Brazil. The 6/27 FT had an article titled “Brazil’s bad loans hit record high in May.” According to the central bank, Brazilian loans overdue by more than 90 days hit 6% last month, the highest since records began in 2000. “The central bank has slashed its benchmark interest rate by 400 basis points in less than 10 months to a record low of 8.5 per cent, in a move the government expected to spur growth. Despite this, banks have been reluctant to speed up lending because of the steady rise in non-performing loans.” New car sales dropped almost 10% y/y in May as rising defaults on car loans discouraged lenders from making new loans. In May, the government introduced a $10 billion stimulus package to revive car sales. (3) More downbeat indicators. Forget about Germany decoupling from Europe’s recession by finding more export business elsewhere. German unemployment climbed in June for the fourth month this year. The impact began to be felt in October, when a 27-month drop in unemployment ended. UK house prices fell in June by 0.6% m/m and 1.5% y/y, the biggest such drop since August 2009. The European Commission said its overall measure of confidence in the euro zone fell for the third straight month to 89.9 from 90.5. The health care industry's private payrolls rose by 6.3 million since 1990 to a record 14.3 million during May. That accounted for 26.4% of the gain in total payrolls over this period. Health care jobs now account for a record 10.8% of total payrolls, up from 7.3% during January 1990. The next earnings season is about to begin. Industry analysts have been curbing their enthusiasm for Q2-2012 results since the end of Q1. They’ve lowered their S&P 500 estimate for the current quarter from $26.11 during the week of March 30 to $25.38 during the week of June 21. That would put the quarter up only 5.2% y/y, the weakest since the end of the recession. Over the same period, they’ve also cut their estimates for Q3 and Q4. The consensus bottoms-up forecasts for 2012 and 2013 are down to $105.07 and $117.94. Forward earnings, which is the time-weighted average of the current and coming year estimates, has recently flattened out around $111.26. That’s actually quite bullish since forward earnings tends to be a very good leading indicator of actual S&P 500 operating earnings over the coming year. If so, then actual earnings should add up to about $110 from now through mid-2013. I am forecasting $110 for next year, so I feel very comfortable with the latest forward earnings. There is one rather important caveat, I must add. 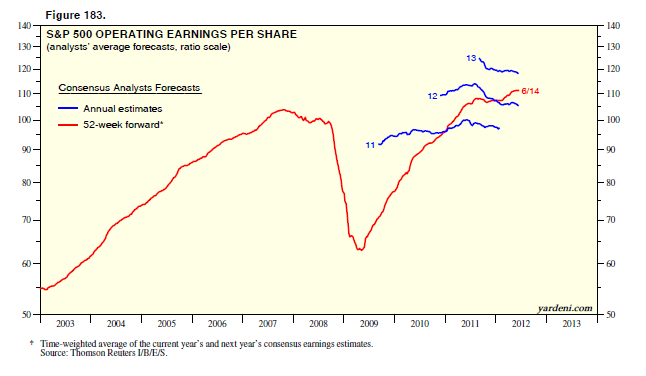 Forward earnings is an excellent leading indicator of actual earnings when the economy is expanding. Industry analysts don’t see recessions coming and tend to lower their estimates as the economic news worsens. So forward earnings is actually a lagging indicator during recessions. I'm sure Fed Chairman Ben Bernanke keeps a calendar. However, he must have forgotten to look at what is scheduled to happen at the beginning of 2013. On several occasions recently, he himself warned members of Congress about the “Fiscal Cliff” of spending cuts and tax increases that could clobber the economy early next year unless current legislation is changed before the end of this year. Yet he and his colleagues on the FOMC voted last week to extend Operation Twist to the end of this year. So now the US economy is facing three homegrown challenges: The Fiscal Cliff, the Monetary Ledge, and the Credit Divide. The Fed should get lots of the blame for putting us in this predicament. With QE2, the Fed enabled more of Washington’s fiscal recklessness by purchasing $600 billion of US Treasuries at an effective cost of 25bps to the Treasury. QE2 was followed by Operation Twist. The goal was to bring bond yields down at the same time that the FOMC was extending its promise to keep the federal funds rate near zero through 2014. (1) As I discussed last week, the Credit Divide has made it very hard for debt-challenged borrowers with negative home equity to refinance their mortgages. The value of homes plunged 30.0%, by $6.7 trillion from a record high of $22.7 trillion at the end of Q4-2006 to $16.0 trillion at the end of Q4-2011. Over this same period, the value of homeowners’ equity imploded by 51.5% to $6.2 trillion. Americans collectively now own only 40.7% of their homes, down from a recent peak of 61.2% during Q1-2001, according to the Fed’s Flow of Funds data. (3) Exacerbating the Credit Divide is the flattening of the yield curve that has been so successfully engineered by the Fed. Banks have less incentive to lend when the spread is narrow. The squeeze on their net interest margins depresses their net operating income. 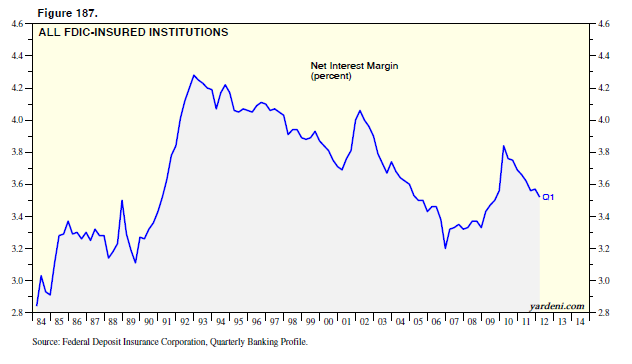 For all FDIC-insured institutions, that margin has dropped from a recent peak of 3.84% during Q1-2010 to 3.52% during Q1-2012. Over this period, their net interest income has been flat just north of $100 billion per quarter. Last week, Moody’s downgraded 15 major banks that are the largest players in the global capital markets, including five US-based banks. Some of them reacted by charging that the downgrades were unwarranted and don’t jibe with their improved liquidity and capital adequacy. This weekend, the WSJ editors had fun asking, “Wasn’t [Dodd-Frank] reform supposed to make the financial system stronger?” They suggested that such regulatory excesses might be making banks weaker rather than stronger. I would add that the Fed’s monetary policy excesses aren’t good for banks either. (1) Mortgage activity indexes are mixed. The good news is that record low mortgage rates are starting to boost the refinancing index compiled by the Mortgage Bankers Association. It rose during the week of June 15 to the highest reading since April 2009. The bad news is that the index of mortgage applications for new purchases has been stalled at the lowest level since the mid-1990s for the past three years. Overall home mortgage net lending continued to contract during the first quarter, as it has been doing since Q4-2008. (2) Negative home equity is a major cause of the Credit Divide. Households with negative equity can’t refinance their mortgages to take advantage of record low rates. The Fed’s Flow of Funds data show that owners’ equity in household real estate has been hovering around $6 trillion since late 2008. It is down a whopping 50.4% from its record high of $13.5 trillion during Q1-2006. Prior to Q4-2007, homeowners’ equity exceeded outstanding mortgage loans. Since then, households have collectively owed more than the equity in their homes. Prior to Q4-2007, owners’ equity exceeded 50% of the value of household real estate. It was down to 40.7% during Q1-2012. (3) Consumer credit is expanding again. Revolving credit (i.e., credit card debt) is growing again, but very slowly after falling by $177 billion from July 2008 through April 2011. Since then, it is up by $11.4 billion. Nonrevolving credit is expanding more rapidly. Auto loans are rising along with auto sales. However, the fastest-growing component of consumer credit is student loans. That’s certainly contributing to the Credit Divide. College graduates who are saddled with large tuition debts are less likely to qualify for auto and mortgage loans. Another earnings season is starting, and industry analysts are preparing for it by once again lowering their estimates. And once again, this may set the stage for lots of positive earnings surprises. However, this time their downward revisions may reflect fundamental weakness in business for companies with exposure to Europe. In this case, there might be fewer positive and more negative surprises. 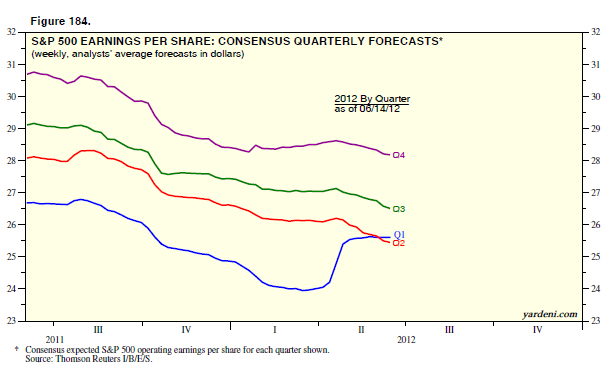 The consensus forecast for S&P 500 operating earnings during Q2 fell to $25.45 per share during the week of June 14. That’s down $0.70 from the end of the previous earnings season at the end of April. The estimates for Q3 and Q4 have also been revised down over this period by $0.51 and $0.40, respectively. As a result, the estimate for all of 2012 is now down $1.24 since the end of April to a new low of $105.31. The 2013 estimate is also down to a new low of $118.18. That’s still above the $110 number that Joe and I are using for next year. Since rising to a new record high during the week of June 1, S&P 500 forward earnings has stalled around $110. Among the worst examples of policymaking in response to a financial crisis is Japan, which is working on its third lost decade. The response to the collapse of the country’s real estate boom in the early 1990s was lots of deficit-financed government spending on roads and bridges to nowhere that nobody needed. When such Keynesian stimulus failed to work, the Bank of Japan joined in with zero interest rates and quantitative easing. The broken banking system was never properly fixed. European leaders seem to be going down the same road. They repeatedly meet in response to the latest flare-up in their financial crisis, and agree that something must be done. The specifics are always vague, and the implicit assumption seems to be that if all else fails, the ECB will have no choice but to load up on the debt of debt-challenged euro zone governments. This morning’s FT reports that the leaked draft of the communique of the latest meeting of the G20 boldly declares: “The euro area member states…will take all necessary policy measures to safeguard the integrity and stability of the euro area, including the functioning of financial markets and breaking the feedback loop between sovereigns and banks.” So don’t worry: They will do something. Meanwhile, here in the US, Fed officials will start their two-day meeting of the FOMC today. They are widely expected to do something too. 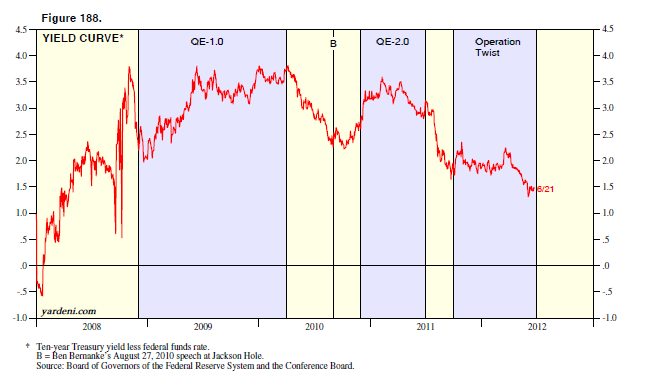 They might extend Operating Twist, though they are running out of short-term Treasuries. They might do QE3, though QE2 and Operation Twist didn’t really work. Indeed, in yesterday’s WSJ, Jon Hilsenrath reports that “Fed officials have been frustrated in the past year that low interest rate policies haven't reached enough Americans to spur stronger growth, the way economics textbooks say low rates should.” Could it be that they are starting to realize that monetary policy can’t fix all of our problems? The Fed can’t do much about the “credit divide.” Fed Chairman Ben Bernanke has already warned that monetary policy can’t offset the coming “fiscal cliff.” So what is to be done? Simpson-Bowles! This deficit reduction plan provides a supply-side solution to our economic woes by slashing margin tax rates and corporate tax rates. It does so by eliminating $1 trillion of tax loopholes, which greatly simplifies the tax code. It should generate enough revenues to meaningfully reduce the federal deficit. It could happen after November 6. Last week, bad news was good news. Indeed, Friday’s WSJ included a story titled “Bad News Sparks Blue-Chip Rally.” This week starts off with mixed news out of Europe as Greek voters gave a very narrow victory to the pro-bailout coalition. I’m putting a checkmark on my June 5 “Checklist for Optimists,” in which I wrote that the Greeks might stay in the euro zone after all. (1) UK exports drop sharply. On Friday, the UK reported that the goods and services trade deficit soared to £4.4 billion in April, up from £3bn in March, as exports to the euro zone plunged. April’s trade gap was the highest since August 2005 and the second widest since comparable records began in 1992. The increase was driven by an 8.6% drop in exports, including a 6.8% fall in exports to the EU, the UK’s biggest trade partner. However, the decline in exports to non-EU countries was even sharper, with a 10% drop to £11.8bn as markets such as China, the US, and Russia bought fewer cars and pharmaceuticals. (2) Merkel says "nein" again. Meanwhile, European leaders seemed intent on blaming each other for the Euro Mess rather than on working together to clean it up. On Thursday, German Chancellor Angela Merkel stated that Germany is the euro zone’s “anchor of stability and growth engine.” However, in her speech before the German parliament, she declared, “Germany’s resources are not unlimited.” She once again forcefully rejected the “apparently simple ideas about mutualization” of debt. The German Chancellor then publicly stated her concerns about the competitiveness of the French economy. Her finance minister Wolfgang Schäuble, in an interview with an Italian newspaper, criticized French President François Hollande’s decision to restore the right of some workers to retire at 60 at a time when most European countries were extending the retirement age. (3) Deposits pouring out of Spain and Italy. May TARGET2 data came out last week for several of the euro area countries. They show that the debit balances of the central banks of Spain and Italy widened to €345bn and €275bn, while the German Bundesbank’s credit balance rose to €699bn. Over the past 12 months through May, the data suggest a total net deposit outflow of €584bn from Spain and Italy and a net inflow of €375bn into Germany. During May, the implied outflow from Spain and Italy was €38bn, while the net inflow into Germany was €54bn. April data for euro area Monetary Financial Institutions released on Thursday showed that loans to private sectors are down €103.6bn over the past seven months. We’ve updated our US Flow of Funds chart book with data for the first quarter. I don’t see all that much deleveraging going on. Most of it is happening in the financial sector rather than the nonfinancial sector. The latter actually rose to a new record high of $38.6 trillion, up $5.6 trillion since Q1-2008. That was led entirely by the rise in US Treasury debt to a record $10.9 trillion, while the debt of the other nonfinancial sectors flattened out around $28 trillion. There has been some modest deleveraging happening in the household sector, where outstanding debt peaked at a record $13.8 trillion during Q1-2008. It is now down to $12.9 trillion. On the other hand, nonfinancial business debt rose to a record $12.0 trillion during Q1. Nonfinancial corporations have taken advantage of record low interest rates to issue $400.0 billion in the bond market over the past four quarters. Some of these funds may be going into stock buybacks, as suggested by the net decline of $477.5 billion in nonfinancial corporate equities outstanding over the past four quarters. Demography is destiny. If so, then the future will be challenging in many countries around the world where fertility rates have dropped below the replacement rate. At the same time, people are living longer. So dependency ratios--the number of retirees divided by the number of earners--are destined to soar. Why have fertility rates fallen around the world? There are a few plausible explanations. One of them stands out, in my opinion: Socialism may breed infertility! In the past, people relied on their children to support them in their old age. Your children were your old-age insurance policy. Over the past few decades, people have come to depend increasingly on social security provided by their governments. So they are having fewer kids. That’s fine as long as the ratio of retirees to workers isn't so high that the burden of supporting our senior citizens crushes any incentive to work resulting from excessively high tax rates. The cost of increasingly generous and excessive entitlements has been soaring relative to taxable earned incomes even before dependency ratios are set to rise in many countries. Governments have chosen to borrow to finance social security and other entitlements, to avoid burdening workers with the extremely high tax rates that are necessary to balance entitlement-bloated budgets. Median ages are highest in advanced economies with large social welfare states. Among the 45 major countries, Japan has the highest median age (44.7), while the Philippines has the lowest (22.2). Advanced economies tend to have higher median ages than emerging ones because they provide more social welfare, which boosts longevity and depresses fertility. Bond markets may be starting to shut down for countries that have accumulated too much debt. That’s creating a Debt Trap for debt-challenged governments. If they slash their spending and raise their tax rates, economic growth will tend to slow. If tax revenues fall faster than spending, their budget deficits will widen. There has recently been an outcry about the hopelessness of such “austerian” policies that perversely lead to higher, rather than lower, debt-to-GDP ratios. The demographic reality is that people around the world are living into their 80s and 90s. Some of them believe that they are entitled to retire in their late 50s and early 60s even though they are living longer. Yet, they didn’t have enough children to support them either directly (out-of-pocket) or indirectly (through taxation). Instead, they expect that their governments will support them. So governments have had to borrow more to fund retirement benefits. That debt is mounting fast and will be a great burden for our children. The result can only be described as the Theft of Generations. I’m not a big fan of indexes of leading economic indicators (LEI) because they can be misleading. The monthly LEI compiled by the Conference Board for the US has had to be redesigned a couple of times because it diverged so much from the subsequent performance of the index of coincident economic indicators (CEI). However, I continue to monitor both the LEI and the CEI for the US. They both show that the US economy is expanding and should continue to do so. Of course, there is also the Weekly Leading Index compiled by the Economic Cycle Research Institute (ECRI). It has turned more ominous lately. However, it has been much more volatile than the monthly LEI and CEI since 2008. That might be because it probably gives more weight to financial variables like the S&P 500 and the spread between the yield on corporate junk bonds and the 10-year Treasury yield. (1) Trade. Exports in May rose 15.0% y/y to a record high, beating April's 4.9% gain. Similarly, May imports were up 12.7%, compared with April's 0.3%. Despite the recession in Europe, exports to the 27-nation European Union actually increased 6.0% in May, and 25.4% over the past three months almost back to last year's record high. Exports to the United States and to the "rest of the world" (excluding the US, EU, and Japan) jumped 10.9% and 10.6%, respectively, to new highs last month. (2) Production. In May, China's industrial production rose 1.1% m/m and 9.7% y/y after a 9.3% rise in April. Electricity output rose only 3.2% last month, though it tends to be very volatile on a m/m basis. The three-month average increased 3.6% y/y, the weakest growth rate since July 2009. (3) Retail sales. May’s passenger vehicle sales were up 22.6% y/y to 1.28 million vehicles. That beats April's 12.5% growth, which itself was an encouraging turnaround from a 1.3% decline from a year earlier. However, overall retail sales growth slowed a bit in May to 13.8% y/y from April's 14.1% pace. (4) Fixed investment. Fixed asset investment climbed 20.1% in the January-May period from a year ago, just above forecasts for a 20% rise. Property development investment for the January-May period was up 18.5% y/y. The WSJ calculated that investment in May was up 18.2% from a year earlier versus a 9.2% rise in April. The official statistical bureau doesn't issue data for individual months. (5) Money and Credit. Chinese banks made 793.2 billion yuan ($125 billion) worth of new loans in May. That’s up slightly from April’s 681.7 billion yuan lending pace. China's M2 rose 13.2% y/y in May. It has been hovering around 13% since the start of the year. Given the strength of most these various indicators, why did the PBOC ease? The government is intent on boosting economic growth. China's central bank last week cut interest rates for the first time since the depths of 2008/09 global crisis while giving banks more freedom to set lending and deposit rates in a step along the path of liberalization. The central bank also reduced banks' reserve requirement ratio three times since last November to pump out additional funds that can be used to boost lending. In recent weeks, the government provided incentives to purchase energy-efficient household appliances, targeted tax cuts, and accelerated approval for investment projects by companies and local governments. On Friday, officials called for additional spending on railway construction. The PBOC has more room to ease since inflationary pressures are abating. China’s CPI came in at 3% y/y in May, down from 3.4% in April. China’s PPI fell 1.4% y/y in May, after a 0.7% y/y decline in April. The German manufacturing sector continues to battle headwinds. Factory orders fell 1.9% in April after an upwardly revised 3.2% gain in March (vs. the preliminary 2.2% estimate), remaining in a seven-month flat trend. Domestic orders rose for the third time in four months in April for a total gain of 3.1%. Foreign orders sank 3.6% after a 4.4% jump in March. Foreign orders from the non-euro region led April’s decline, plummeting 4.7% (after a two-month surge of 11.9%). These consumer and capital goods orders fell 11.1% and 7.3%, respectively, after soaring 11.2% and 15.2% in March. Orders from the euro area fell for the fifth time in six months (by 13.4%), with capital and consumer goods orders down 21.2% and 5.2% over the six-month period. German production remains volatile around recent highs. Industrial output slumped 2.2% in April after a downwardly revised 2.2% (from 2.8%) gain in March. It’s within 3.7% of its cyclical high last July. Capital goods output declined for the first time this year by 3.6% in April, falling to the bottom of its recent flat trend. Consumer goods production fell for the fifth time in six months, down 4.2% over the six-month period to its lowest level since February 2010. It’s 6.8% below its cyclical high last summer. (1) During 2010, the S&P 500 forward P/E dropped 22% from a high of 14.7 on January 11 to a low of 11.4 during August 26. However, forward earnings rose all year. So the 16% correction in the S&P 500 from April 23 to July 2 was reversed by the end of the year, with the P/E ending at 13.1. (2) During 2011, the P/E fell 25% from 13.6 on February 18 to 10.2 on October 3. Forward earnings rose during the first half of the year and remained mostly flat during the second half at a record high. So once again, the market recovered and closed higher by the end of the year with the P/E rebounding to 11.7. (3) During 2012 so far this year, the P/E peaked at 13.0 on March 26. It was down 11% to 11.6 yesterday, just about matching the 2010 low, which was 11.4. The S&P 500 is down 9% from its high on April 2, which is still just a garden-variety correction. Meanwhile, forward earnings rose to a new all-time record high of $111.27 during the week of May 31. At this level, a retest of last year’s panic low P/E of 10.2 would push the S&P 500 down to 1135, which would be a 20% decline from the year’s high on April 2. As you can see in our Earnings & Valuation: S&P 500 Blue Angels, the market’s volatility is attributable almost entirely to the volatility in the P/E. Earnings expectations tend to change more slowly and smoothly. 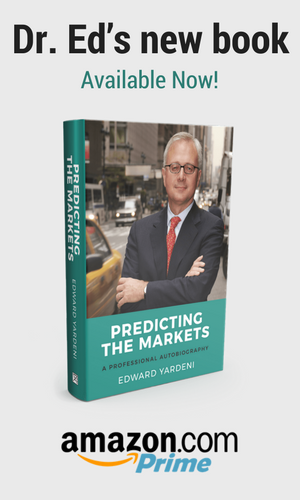 The one exception is during recessions, when both variables take a dive. During the bear market from October 9, 2007 through March 9, 2009, the P/E plunged 32% from 15.1 to 10.2, with forward earnings diving 29%. The P/E actually bottomed at 8.9 on November 20, 2008. On the first business day of each month, manufacturing purchasing managers indexes (M-PMIs) are released for the US and several other countries. When the global economy is growing, they tend to exceed 50 and to be bullish for stocks. On Friday, we learned that the M-PMI for the US dipped from 54.8 in April to 53.5 in May. That’s not too bad, really. China's index dropped from 53.3 to 50.4. It’s still above 50, but disappointing relative to expectations. The unexpected jaw dropper was the index for the UK, which plunged from 50.2 to 45.9. The euro area’s M-PMI sank even lower, from 45.9 to 45.1. That wasn’t unexpected, but it confirmed that the region has fallen into a recession that is worsening. The M-PMIs were well under 50 for Spain (42.0), France (44.7), Italy (44.8), and Germany (45.2). Germany’s index has dropped sharply recently from a reading just above 50 during February. Manufacturing has been the leading source of growth during the latest global economic recovery, including in the US. The concern is that neither the US nor China can continue to grow for very long if the European recession continues to deepen. I think they can. However, there has always been a very strong correlation among the various M-PMIs over the business cycle. So it’s not surprising that the stock market’s reaction on Friday suggests that investors are skeptical and questioning whether the M-PMIs can decouple. Let’s consider the breakup of the euro zone. Is it inevitable? I believe that the founders of the EMU must have known that a monetary union without fiscal unification would eventually experience a major crisis. My hunch is that they assumed that it would force the Europeans to implement a fiscal union. That assumption is getting stress-tested right now. In my opinion, there is a plausible scenario in which the euro zone comes together rather than splits apart. Indeed, European leaders are starting to talk the talk. The question is whether they will walk the walk. On Thursday, Mario Draghi, the ECB chief, said that the euro zone needed "further centralization of banking supervision." He appeared to give a general endorsement of the proposal outlined on Wednesday by the European Commission to create a "banking union" that would be based on a centralized regulator and bailout fund as well as an EU-wide deposit insurance backstop. (1) Bank run in Spain. According to data compiled by Spain’s central bank, foreigners reduced their deposits at Spanish credit institutions by 102.3 billion euros from a record high of 547.1 billion euros during June 2011 to 444.7 billion euros during March. In March alone, the outflow was 30.9 billion euros, and it probably accelerated during April and May. (2) ELA propping up banks in Greece. The latest ECB balance sheet for May 25 shows a rise of 34.1 billion euros to 246.6 billion euros in “other claims on euro-area credit institutions denominated in euro.” This item includes the Emergency Loan Assistance (ELA) facility. Under ELA, the 17 national central banks in the euro area provide emergency liquidity to banks that can’t put up collateral acceptable to the ECB for refinancing operations. The risk of the lending is carried by the central bank in question, ensuring any losses stay within the country concerned and aren’t shared across all euro members. On May 17, the ECB confirmed it had moved some Greek banks onto the ELA program of Greece’s central bank until they are recapitalized. 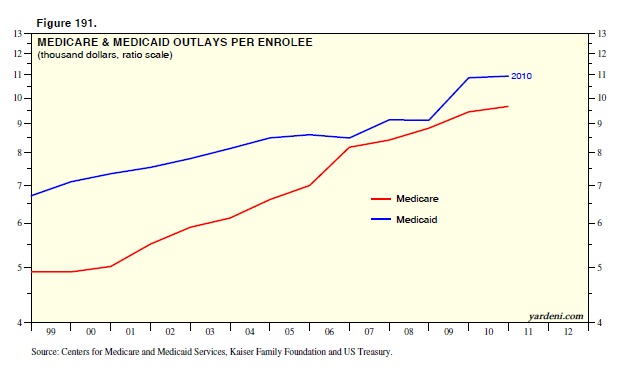 (3) TARGET2 imbalances widening rapidly. TARGET2 is the euro’s cross-border payments system coordinated by the ECB with the participation of the national central banks. Floyd Norris did a good job of explaining how it works in his 5/31 NYT column. Prior to January 2009, the payments system was relatively balanced However since then, the Bundesbank’s balance has soared from 133.7 billion euros to 644.2 billion euros as of April. That’s because deposits funds have poured into Germany (as well as Finland, Luxembourg, and the Netherlands) and out of the PIIGS, which had a record negative balance of 851.2 billion euros in TARGET2 in April. (4) Money supply growth is slow and uneven. The TARGET2 balances are more or less consistent with the trends in M2 money supply measures over the past year showing that they are falling in Spain and Greece while rising in Germany. On balance, M2 in the euro zone was up 2.8% y/y during April. This suggests that while the area's depositors are moving their funds from the periphery to the core countries, they aren’t fleeing the euro. However, the recent plunge in the euro suggests that they may be starting to shift funds into the US dollar. Of course, the positive spin on a weak euro is that it should provide some lift to euro area exports. That might help to moderate Europe’s recession, which deepened during May according to the latest manufacturing PMIs. (5) Important elections are ahead in France and Greece. Previously, I’ve observed that at the heart of the European crisis is a crisis of leadership. There are elections coming up that will determine whether the French government will be gridlocked and whether the Greeks can even form a government. My hunch is that the UMP will succeed in denying the Socialists a victory. If so, then a period of "cohabitation" will follow. In this case, French President François Hollande won’t be able to deliver on many of his extremist proposals, and might be less of a pain in the derriere to German Chancellor Angela Merkel. Recent polls suggest that the Greek national elections on June 17 will lead to a governing coalition led by New Democracy and Pasok. I don’t know whether we should be rooting for this outcome or not.